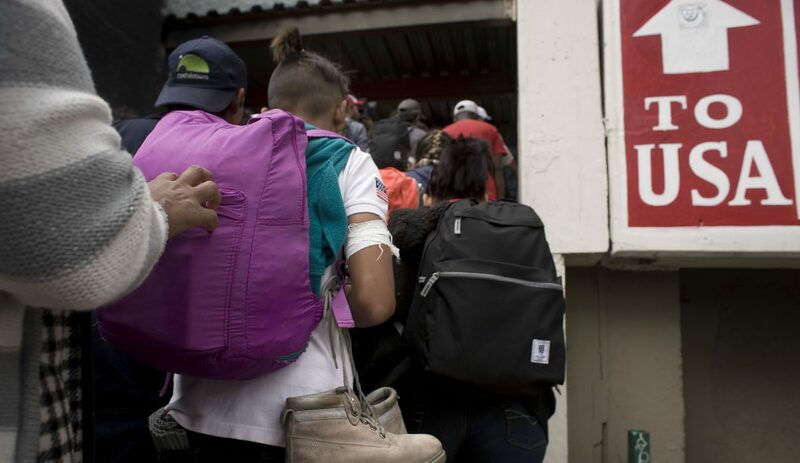 MEXICO CITY (CNS) — The first members of the Central American caravan of migrants have been allowed to make asylum claims, but a Scalabrinian priest said “very, very few” have their applications accepted. Some 20 members of the caravan, which traveled across Mexico and arrived in Tijuana on the U.S. border in late April, were forced to wait overnight by U.S. Customs and Border Protection, which said it lacked to capacity to process them. The annual Stations of the Cross Caravan is organized around every Easter to move Central American migrants from Mexico’s southern border with Guatemala to the U.S. border. The caravan is designed to help the migrants travel safely through Mexico, which has become treacherous for those without the proper papers. The number of participants in the 2018 caravan swelled to more than 1,000 as hundreds of Hondurans joined in, a reflection of the political oppression in the country, where elections were allegedly rigged and the army was sent to quell dissent. The caravan became controversial, however, after some conservative media outlets warned of an “invasion” and U.S. President Donald Trump started tweeting his dismay with the convoy moving apparently unimpeded through Mexico. The numbers dwindled as the caravan traversed Mexico. Organizers say more of the migrants ended up seeking asylum in Mexico rather than risking the U.S. border and uncertainties in the U.S. immigration system. Some were scared off by the prospect of being held indefinitely in detention centers and being separated from their children. “A lot of it has to do with anti-immigrant rhetoric and the idea that the United States is no longer a welcoming place,” said Alex Mensing, spokesman for Pueblos Sin Fronteras, which organized the caravan. Mexican immigration officials issued temporary documents to caravan participants, but additional federal police were sent to the southern border region, the way National Guard soldiers were sent to the U.S. border with Mexico. Mexico detains and deports thousands of Central Americans each month, even as it complains of the mistreatment of its own citizens living in the United States. The Catholic Church has long worked with migrants transiting Mexico, with priests, religious and lay Catholics opening and operating shelters along railway lines — until recently the migrants’ preferred route — the length of the country. Some in the hierarchy, however, had shown a disinterest in migration matters and even preferred to side with politicians acting against the operations of shelters, according to priests and religious who work with migrants. “Things have changed because (Cardinal) Carlos Aguiar (Retes of Mexico City) is making a total change in the direction of the church,” said Father Alejandro Solalinde, an activist priest in Oaxaca, who had previously wanted to open a migrant shelter in Mexico City, but found little church interest. In his April 28 homily, Cardinal Aguiar called for solidarity with migrants. “As Christian communities, as churches, today more than ever … we must be open to help those in need, those at risk of losing their lives, to give them an opportunity to continue living and preaching the Lord,” he said.